Onuoha Ukeh explains that the military's claim that the relaunch of Operation Python Dance in the South East is meant to fight crime, is quite laughable. Does the military really think its relaunch of ‘Operation Python Dance’ in the South East, with the claim that it is meant to fight kidnapping and other criminal activities, is believable? If it does, it means that the leadership of that institution takes Nigerians for fools, especially at a time when kidnapping, armed robbery and sundry crimes abound in other parts of the country without any major deployment of soldiers. Yes, kidnappings and armed robbery are rampant on the Abuja-Kaduna-Zaria expressway flank, for instance, to the extent that the Inspector General of Police, Ibrahim Idris, had to remove all police DPOs, Commissioners of Police and Assistant Inspectors General of Police (AIGs) in the area, yet soldiers have not been massively deployed. There are also kidnappings and crimes in other parts of Nigeria, but the military has not been unleashed soldiers on residents and people of the affected areas. Therefore, there is more to singling out the South East for such show of military strength and might. Indeed, it is pertinent to ask these questions: Why is it that a legion of soldiers and military hardware have been deployed to the five states of the South East when there is no war or insurrection in the place? Why is it that Abia and other South East states are swarming with armed soldiers, who are brutally dealing with people, against global military rule of engagement, relating to civilians? Why has the military chosen to raise unnecessary tension in the South East and further worsen security situation? For the avoidance of doubt, the hitherto peace enjoyed in the South East geopolitical zone, despite the wrong picture the authorities were painting, has been deflowered with the military deployment. Now, Aba, the commercial nerve centre of Abia State, is under curfew, from as early as 6pm, with residents afraid to even step out for their legitimate businesses during the day. And people are being victimised, tortured and maimed because of the activities of the Indigenous People of Biafra (IPOB). Reports and video clips on the military operation in the South East show the most inhuman treatment of innocent people by this invading army. The soldiers are executing orders in the most callous way, flogging their victims like animals, making them to lie down in ponds for hours and liquidating some of them in the process. I have really wondered what message the government thinks it is sending out to the Igbo and the world. At a time south easterners need protection, they are getting horrendous treatment in their own land. 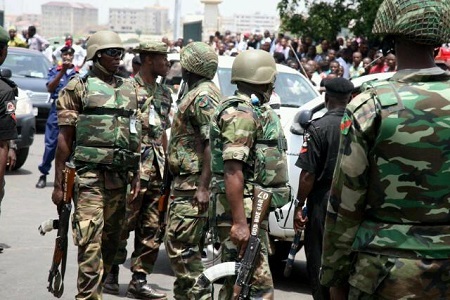 Coming just a few months after a coalition of Arewa youths issued a quit notice to Igbo living in the North and no action was taken against them, the ongoing military operation further shows the treatment of Nigerians on unequal measures. If Arewa youths issued a quit order to Igbo to vacate the North, and there was no military deployment in the areas wherein the Igbo were under threat, and the military turns around to deploy troops to South East, it says much about how the Federal Government perceives people from the South East. To say the least, if there is anywhere the military and the government are supposed to deploy soldiers, it is in the North, where the Igbo and other non-indigenes are living in fear, following an earlier quit order. Granted that the Arewa youths have suspended the quit notice, the government knows that there is need for security guarantee in the North, especially as the October 1 earlier deadline approaches. For one, Arewa youths outlined conditions on which they suspended the quit order. Therefore, there is still the feeling that Igbo are not safe in the North. And the fact that President Muhammadu Buhari, in his ‘return home’ broadcast, did not condemn, outright, that quit order, but only said all Nigerians were entitled to live and do business in any part of the country leaves much to imagination. Of course, condemning the quit order and saying that Nigerians were entitled to live and do business in any part of the country are not the same thing. Whereas the former is an assurance that the government, which President Buhari leads, is against the quit order, the latter is stating the obvious, as the constitution gives Nigerians the liberty to live and do business anywhere in the country, within the ambit of the law. At present, tension has been heightened by the indiscretion of deploying troops to the South East. Just as it did not achieve anything tangible in 2016 other than making the agitation for Biafra to resonate, when Nnamdi Kanu was under incarceration, the chances of the government achieving anything currently is low. Using force to suppress people who feel shortchanged in a country they think they have equal rights would not work. Rather, it will increase the agitation and a feeling of alienation. By its actions, there is no doubt that the government has not learnt any lesson from the mistake of arresting Kanu, in the first place, over Biafra agitation. Whether the government believes it or not, the arrest of Kanu was one of the most fundamental errors it has made. This is because with the arrest and detention, Kanu was transmogrified from a simple director of Radio Biafra to the youths’ hero and his followers’ symbol of emancipation. And the worst mistake the government would make is to re-arrest him or to drive IPOB, the Movement for the Actualisation of the Sovereign State of Biafra (MASSOB), Biafra Independence Movement (BIM) and other agitating groups in the South East underground. This was the error made in the Niger Delta, which did cost Nigeria a lot, until the late President Umar Yar’Adua, in his wisdom, initiated the amnesty programme and quelled the agitation in the region. The current government’s attitude would not produce good result. Those advising the government to toe that line may think that crackdown would stamp out agitation in the South East, but it is apparent that this would increase it. When the things that fuel Biafra are left unaddressed, there is no way the agitation or identification with it would go away. Just like government believed that arresting Arewa youths, who issued quit notice to Igbo would have further increased tension and insecurity, re-arresting Kanu, through military force or the revocation of his bail would cause the same. Such plot, if it is the goal of Operation Python Dance, will be a disaster. Therefore, the government should retrace its steps, withdraw the military from the South East and allow the dialogue the South East governors and Ohanaeze Ndigbo initiated to run its course. It does not make sense that just three weeks after South East governors, Ohanaeze organisation and some Igbo leaders met with Kanu and his group, with the plan of further meetings, the government ordered a military onslaught. Such an act shows that some unpatriotic elements in government do not really wish the country well and, therefore, taking actions to exacerbate problems. For the IPOB and other pro-Biafra groups’ leadership, they should know that caution is not a mark of cowardice. They should know when to talk and how to say it, when to keep quiet and when to play the fool. Confronting military personnel, who are on a mission to kill, will only be counter-productive. Doing so will be tantamount to playing into the hands of those looking for an opportunity to descend on the Igbo. And for other Nigerians who are watching and clapping for the military and government, as the Igbo are being dealt with, one message is this: Those who sit back and commend evil tendencies will, one day, discover that they would not be spared. Igbo are being dealt with today and others are not talking. This will embolden those carrying out this suppressive programme. Tomorrow, the oppressors of our people will take on others. And the undemocratic practices as well as dictatorship will subsist.